Whew. The reality is God gives us a lot of freedom when it comes to how we connect with Him and others. Even among the disciples we see a lot of variety—for example, boisterous Peter and gentle John. What matters is that we understand how we’re wired and then respect it. For years I tried to live like an extrovert (I share more about this in the You’re Already Amazing LifeGrowth Guide Session Four Video). I ended up exhausted, anxious and even physically sick. Research has shown that how much a woman thrives is impacted more by how much time she spends in her sweet spot than any other factor, and that sweet spot includes your social strengths. When you align with who God created you to be, everything changes. You’re fully alive, others are blessed, and He is glorified. Yes, serving others includes doing what’s hard and stepping out of our comfort zones at times. But denying ourselves doesn’t mean denying who God made us. “For we are God’s masterpiece. He has created us anew in Christ Jesus, so we can do the good things he planned for us long ago” (Eph. 2:10 NLT). And loving well the way we’re created to is the best thing of all. I’m so glad that we can learn about relationships together, friends! P.S. Congratulations to Linda Perkins, the giveaway winner from last Monday! Wow, this is so me. I am now 65 years old and have always been an introvert. I love one on one conversations with people and in crowds I feel lost and generally end up in a corner somewhere by myself. I’ve even had panic attacks just trying to find one person to connect with – even in family gatherings. This is definitely the way I am wired as I look back and see myself the same when I was a child. Through the years in my 30’s and 40’s I was able to do group things more – but lately I dread large groups again. Thank you for this message. I just came home from a weekend with my best friend from high school. We’re still best friends. When we’re together, it’s like we’ve never been apart. This idea of how we relate best to others resonates with me today because my friend and I were talking about how we reconnected after about twelve years out of high school. And how I called her at a particularly LOW point in her life and then walked with her through it. And that’s the key to being who we’re meant to be. We need to dwell wherever it is easiest to hear God’s voice. For me, it is morning quiet time and plenty of silence for writing. I can hear God much better without the distractions of noise and people. For others, God speaks to them in the crowded places. Thanks for reminding me to be who God created at all times and in all places. This message touched my heart too. Not sure if I am an introvert or extrovert. I need to be around people more than I need to be alone…I think. HA! Anyway, the part to touched me was being who I am when I minister – write, speak, interact. I am not a wild girl. I have a sense of humor but I am not hysterically funny. I am soft spoken and engaging. That’s how God made me. I am Just me (my blog addresses this subject too, so I think this is a message I need to hear). I really laughed when I read the words Social Butterfly! I have been called that all of my life. I feel that sweet spot as soon as I am surround by a group or people, I sometimes call myself the gatherer, because I love to get things going and moving and I am the cheerleader for those who think that they can’t do something. I am the one who says why not or how can we get going? My problem is that a lot of times I tend to leave God in the dust. Thank you Lord I’ll take it form here. That is when I feel the frustrations, disappointments, and heart aches. One of the truths that God spoke to me in this lesson was to stop chasing after the person that I think everyone one wants me to be. He has given me an identity through his son Jesus Christ. I need to stop and let God direct my steps and trust his plan. One of the prayers that I have been praying is that I will know in a supernatural way God’s love and that I am safe with him. Thank you for this study the timing is more perfect than you can ever know. Wow Holley i’m like 80% you! Introvert with social anxiety. I can only relate to a few people at one time. Only thing is i’m not good with words although i consider myself to be somewhat creative. Still trying to figure out how God can use my gifts. Thank you so much, Holley. This post was very timely and definitely describes me! I am very much an introvert and struggling right now to embrace that. I’ve tried for years and still try at times to force myself to be an extrovert and I end up miserable and usually fail at the attempt. I don’t like “small talk” and only prefer a small group of people at one time. Large groups and small talk exhaust me. However, because I am an introvert, people often mistake me as being unapproachable, uncaring, and not interested which couldn’t be farther from the truth. I very much love people, am interested in them, and care about them……just in small doses or one-on-one. I am trying to embrace who God made me so I can be more effective for His Kingdom. The struggle is real! I spoke of your blog with my friend J on our run last week… As we were talking about how much we enjoyed our company on our runs, the accountability, etc. I told her, like Holley I like to have a coffee with a friend, but my real ‘coffee time’ is these runs. I have a small group of ladies I meet with and we have our time together on the run. I’m so blessed to have these ladies in my life.. Thank you Holley for your inspiration. I am a quiet introvert. I can make others feel at ease easily having spent most of my life as a critical care nurse. But I have been criticized for not needing to be a social butterfly, for being happy at home, for enjoying a simple life. But in this season of my life God is using me to pray for others. To hear Him to know Him to be in His presence is joy. It’s my strength. So despite all the criticism He has chosen my qualities for His glory. What an amazing Jesus I serve! I am with Holley and Jeanne on this when she say’s I’m not a wild girl. I never was, and I did love the quiet and calm that gave me the loving words I wrote. Sharing over the internet has been a blessing, as I do not have a church at the moment. I love praise and worship, but I never thought I could keep up with a frantic young crowd, but I don’t have to. God can either speed me up or slow them down as the case may be. We have to be ourselves, loving Jesus amplifies that, enhances our personality and abilities, and He does things exceedingly above what we ask or think. Impeccable timing, God’s timing is impeccable. This post and the subject matter is very encouraging to the season I’m in at this time. Thank you for all you do to encourage women all around us. Any assessment I have ever taken shows me to be an extrovert, but I am not on the high side of that trait. I don’t enjoy crowds of people even though I love being with a small group or one-to-one. Not quite two years ago, I retired. More of my days are quieter now and I enjoy that a great deal. I think some of that comes from my life being a whirlwind for many years in raising children while teaching and then returning to graduate school in my 40’s and changing careers which led to two different positions before the Lord led me to retire at 70! I do not doubt this extroverted side of me, but I had so little time for the less dominant side, my introverted side, I am getting refilled in that category now. I can so identify with you, Holley. Those three things you mentioned in your list could have been me saying them. I have a hard time accepting myself as an introvert. To believe I’m not lacking somehow in social graces. I’m a work-in-progress. Blessings and hugs to you! Your words rang true with me. I have always felt like a square peg in a round hole because I have fallen into the trap of feeling like a failure for not being a gregarious happy go lucky extrovert. That just isn’t who I am. I’m married to an extrovert who has difficulties understanding why I can’t “work the room” and why I don’t want to immerse myself in large crowds. I am just now recognizing that I’m 1/4 extrovert and 3/4 introvert, and feeling proud of who I am. 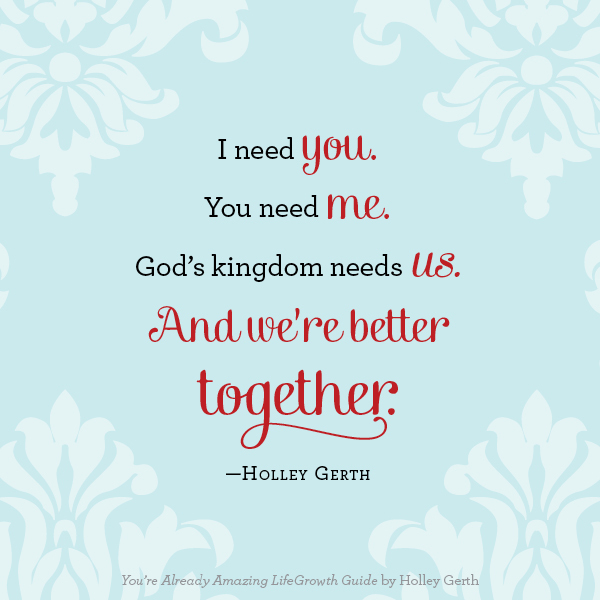 Thank you Holley, as always, for your encouragement and always making me feel your words are meant just for me. Whew! Is right Holley being an introvert myself I understand in ways I do not want to admit because I have been so guilty of falling into the mind set I am not good enough trap especially being a 60-year-old woman who has never given birth to a child of her own. I suppose now is why I am called to put myself out there and heal my pain let go of my fear of being judged, compared, and any other negative thing the father of lies can try to trip me up with. For I now know to whom I belong and how my Lord stretched out His arms on Calvary to free me from all the snares Satan try’s to trip me up with. Amen. Thank You for sharing your heart with us Holley and encouraging us to become the women God has created us to be! And again I say Amen. This chapter was definitely for me! I’m a introvert. Being in a crowd definitely brings on anxiety for me. I really dread being in a party where I don’t know anyone. Love the one on one time I spend with my friends. I do love going to my church and worshiping with my church family. The music inspires me so much! This is a good read. We need each other and we need God to nourish our lives. Likewise we need each other to propagate God’s kingdom. wow this week was so hard. monday was my 65th birthday and after reading the introduction to session 4 i decided i couldn’t do the session and “ruin” my birthday. the first questions were complete the women are and women are not. i am writing this tuesday night after realizing i had written “women are weak and stupid” and “women are not important and not able to take care of themselves.” ouch. will be reading the guide again and this time i will read the Bible much more for answers. Thank you so much for this encouragement, Holly. I quickly find myself comparing the ministry God has given me to that of others and start thinking I should be doing more. But you’re right that God has created us to be who He has designed us to be. For me, that is a quiet introvert, who ministers one-on-one in a quiet way, listening, more than speaking and to people who God has put on my path. It is a good reminder to me too with my writing, not to think I’m unworthy with the little story God has given me, but to share it, knowing God will bring it to those few unique individuals who need to know how much He loves them as they are. So sorry: I spelt your name wrong! I’m not sure I understand completely this topic but what I get from this is to be myself and not try to be like anyone else. Perhaps by daily turning to God for help and guidance, I can meet the needs of the day and offer assistance when necessary. Love is most important and to love and be loved, the greatest gift. Thank you, Holley, for another great post! Hi Holley, This has been a great lesson. I am essentially an introvert. I have always felt out of place in a group of people. I am also a nurse and worked Critical Care and managed a dialysis clinic. Over the years I have collect friends who are predominately extroverts. When we go somewhere in a large crowd they are all off socializing and I am sitting at my table wondering why I am not more like them. My dialysis work took me across the country to meetings and I learned to socialize with people but by the end of the evening I am stressed and can’t wait to be back in my hotel room by myself. God has created me with the ability to talk one to one or one to a few and hear their hearts. I teach a Sunday School class and Women’s Fellowship. I love that. He also has given me strength to be in a crowd when it is necessary. God does meet our needs. Thanks Holley, You are such a Blessing to me in my life, and I feel you are truly God given. May God richly bless you! Thank-you! Wow, I needed to hear this right now, and it’s actually a few days after the post. God convicted me to reach out to teenage girls who are pregnant. I work in a ministry that does that and work with other women in that capacity. Serving this way is new to me and I have struggled with the behavior and “temperature” of the girls and environment. I’ve felt discouraged and confused. After reading this, I think I’ve been pushing myself to make some kind of earth shattering change in the girl’s lives as well as comparing myself to the other godly, sweet ladies who also serve. But I’m not them. They all have different personalities and ways to connect with others, and so do I. I’m so relieved to read this. My Father just wants me to be who He made. If the girls take one good thing from me this year and God grows it in them, then I have served His purpose. God bless you, Holley and all of us, and thank you so much for this encouragement 🙂 I literally just got off of my knees asking God to show me what He wants for me. Praise God! How has God wired me for connections with others? What has he taught me about me? I am gonna answer in reverse order. I have dyslexia, but when I was young they didn’t know what it was. My mind needed extra time and patience to see what the word really was and its meaning. So comprehension skills and summer school were needed. My parents were mindful! As my children grew to school age. I was aware that my younger son s were struggling. So I took the extra time to help them with spelling and comprehension. Reading !!! And then answering questions about what was read. Now that the grandchildren are coming in to my life, I will be there for them. Now for connections with people, my sensitivity and awareness of a child with hearing loss(my youngest son), saying things slowly for lip reading and learning some sign language to help my cousin with every day tasks ; my lifes journey has been something I never thought of as a gift. In my divorce, that is when God sent a special sister in my life , to remember that all of us need that special person to talk to and be there for in times of needr. In my interaction with people of Faith, their is the Holy Spirit connection that sees our body, spirit, and soul as Jesus sees us – saved by grace. In my prison experience (my oldest son) , no one is ever prepared, but it does not matter the circumstances, you share a mother’s love that passes all understanding,. And you are concerned for each other’s sons/daughters well being inside the confiment. Jesus did not come for the law makers – he was the Law, he came for us sinners and to full fill what the prophets fortold – a savior of souls ! We only need Jesus because he made us for his enjoyment. When HE created everything, it was Good! And I was reminded of that. Pray and seek out your Lord in all things, and he will be there with you. When I read your encouragement posts, I just find so many things similar in my perception of the world. I also struggle to be more communicative with others and to be an extrovert. But I fail. It costs me titanic efforts to behave like an extrovert and I still don’t become like them…I often feel weird and out of place on this planet. And I feel more comfortable in a quiet place and prefer to communicate with others one-on-one. Thank you for sharing your feelings, emotions, fears and struggles and especially big thank you for your inspiration and motivation to be who we are created to be!